Do you find yourself fighting to get things done? Do you constantly worry about things you have no control over? Is fear of failure keeping you from having the life you want? My name is Dale East and I spent too many years trapped in the kind of thinking that creates scenario’s like the ones listed above. Then I found a system that allowed me to take control of my mind and my thinking. That system allowed me to no longer live in fear and worry. I no longer battle to take action on the things that are important to my future. When I learned this system, I knew that I had to share what I’d learned with as many people as possible. That’s the reason I wrote this book. Too many of people are trapped in our own limited thinking. That limited thinking is what is preventing them from having the life they really want. Now there is a way to get control of your thinking and dissolve the limiting voice inside our mind. There is a way to get control of the fear and worry that weighs you down, preventing you from living your life to the fullest. The problem is that we’ve been taught what to think rather than how to think. The thoughts that we think determine our reality. By learning to control your thinking and eliminate the thoughts that no longer serve you, you open yourself up to all the unlimited possibilities you’re here to experience. 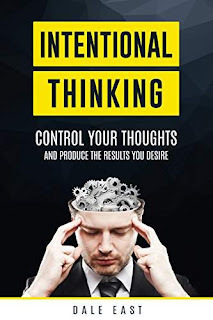 Intentional Thinking is a system for taking control of your thinking so you can take control of your life. Eliminate fear and worry for good. Unleash the unlimited being that lives inside you. Find your happiness in the life you have now. All of this and so much more is possible with Intentional Thinking. Don’t waist another year, month or even week! Get Intentional Thinking today and start changing your thinking so you can change your life for the better.